Geronimo Pole Co. mills a variety of wood species for table and bar slabs. These include Lodgepole Pine, Douglas Fir, Incense Cedar, Digger Pine and some native hardwoods including Madrone, Black Oak and some select exotics. Thickness varies from 1 inch (4 quarter) to 4 inches (16 quarter). Widths vary from a foot to over 4 feet wide. Lengths can go up to 16 feet. Most slabs will have a “live edge” on both sides, which reveals the natural wane or contour of a log. 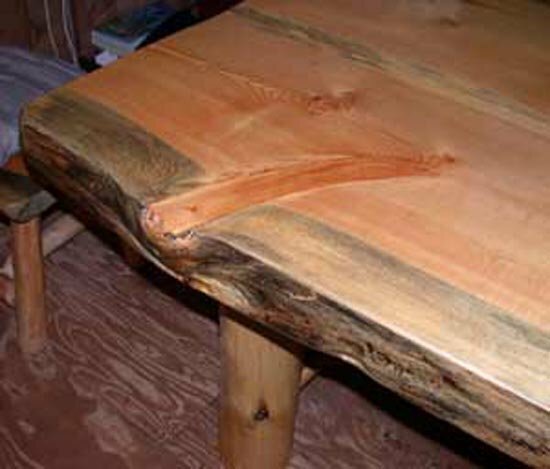 The “live edge” will often reveal textural detail and knots. Certain slabs may include curves, unusual shapes and unique distressed markings. Other slab faces sometimes show longitudinal cut knots and limbs exposing colorful grain and a delicacy of subtle textures. The frequency of knots, irregular grain and checking on certain slabs makes them appear very wild and rustic. Typically our slabs are air-dried and cured one to three years to facilitate stability and longevity. Slabs have been used to create bar tops, stair treads, doors, indoor and outdoor benches, bed headboards, and especially tables. Just imagine a slab in your home. While we typically have well over a hundred slabs in stock of various species and sizes, please call for availability and pricing. They are sold as grades 1, 2, and 3 on an individual basis or in quantity order discounts. Call for a price quote.